I am loving all the holiday launches that have been coming out recently. 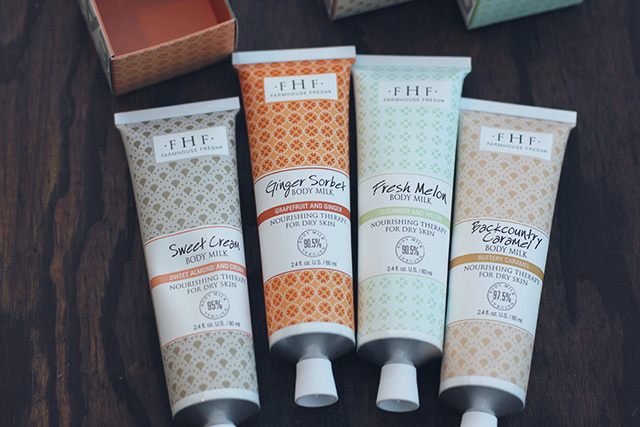 One company I am always following for their delectable bodycare products is FarmHouse Fresh. I am absolutely in love with everything they come out with. 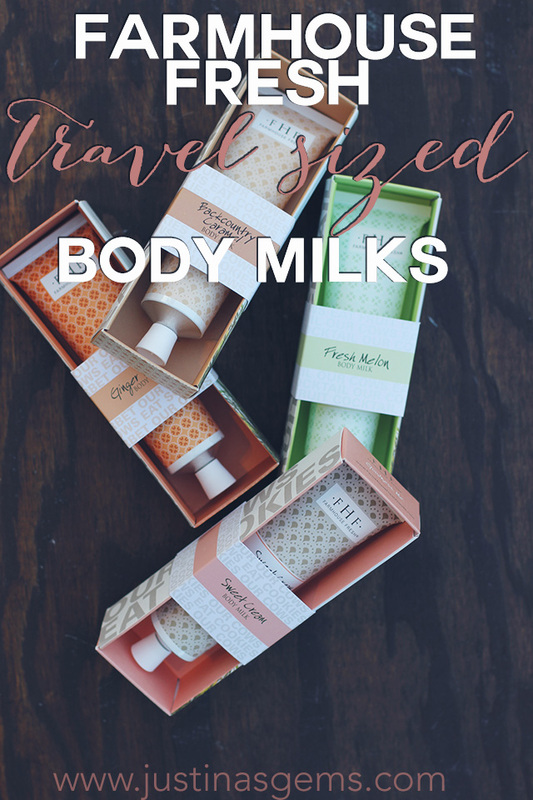 Today I need to share with you their travel sized body milks they have come out with for the holidays! 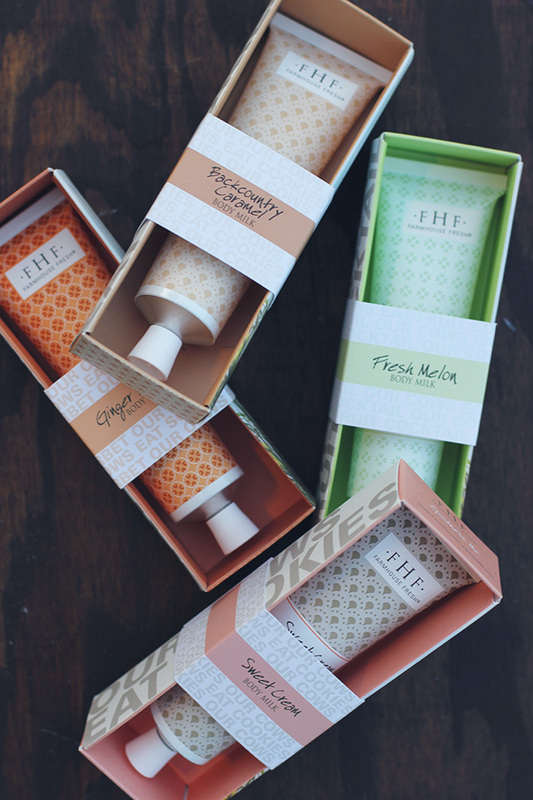 These are shea butter hand creams and they are SO amazing. 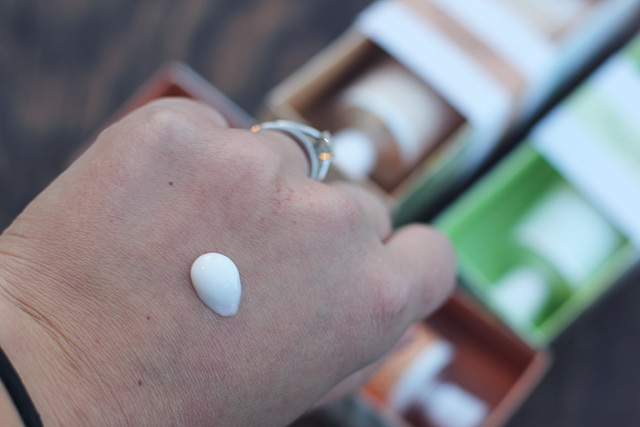 The creams themselves are lightweight and non greasy, yet feel super creamy and rich on the skin. They really hydrate and plump my skin, probably due to the aloe and other oils they contain. They are absolute perfection in terms of how they feel AND smell. I can’t think of a single downfall to these, honestly! Several of their scents they already had going previous to the holidays- Pink Moon, Whoopie!, Front Porch Punch, and a couple more. They have newly released four new scents which are the ones I have: Fresh Melon, Sweet Cream, Backcountry Caramel, and Ginger Sorbet. Fresh Melon: Cool and juicy like a slice of fresh melon. A simply irresistible green melon and natural cucumber extract blend has a refreshing, good morning scent that makes you happy from the moment it hits your skin. 90.5% natural, gluten,paraben, mineral oil and sulfate free. Infused with rice bran, sweet almond, jojoba, avocado and sesame oils. Sweet Cream: Pours over you like milk, and leaves light velvety notes of warm sweet cream. A true treat to moisturize each morning. The scent takes you away to a fine morning tea, with scones, heavy cream and great gal pals. 90.5% natural, gluten, paraben, mineral oil and sulfate free. Infused with rice bran, sweet almond, jojoba, avocado and sesame oils. Ginger Sorbet: Leaves a silky ginger and grapefruit oil scent that’s reminiscent of a creamy, delicious sorbet. 90.5% natural, gluten, paraben, mineral oil and sulfate free. Infused with rice bran, sweet almond, jojoba, avocado and sesame oils. Backcountry Caramel: A warm, sleepy, vanilla-cinnamon scent. Infused with a golden-caramel fragrance that rivals the finest creme brulee. The feel is light, pours like milk, and is a silky vegetable-based lotion. 97.5% natural, gluten, paraben, sulfate, and mineral oil free. Infused with a blend of rice bran, evening primrose, coocnut, soybean, and sunflower seed oils to soothe and soften even the driest and most chapped skin. These are SO yummy. If you weren’t drooling at the descriptions alone, you may want to check your pulse. These are not your average body products either. The scents are not synthetic, they are very real and as I described, they are 90% or more natural with lots of great ingredients. Above you can see the packaging on these tubes is the metal kind that needs a hole poked in it. You can flip the lid around and poke a hole to poke it open. 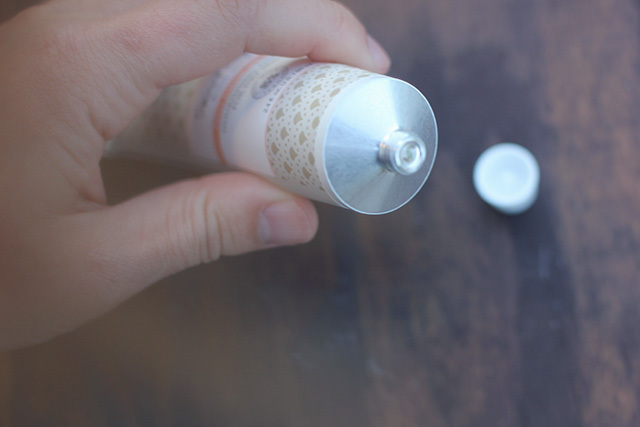 Each of the tubes is 2.4 oz and is decorated with nostalgic motifs and handmade paper-like designs on the packaging that are inspired by simple repeat patterns of vintage wallpapers and towels. They are travel friendly and definitely checkbook friendly for gifting for yourself and others at just $14 each. There is so much thought put into even just the packaging- the decorative boxes have sweet sayings on them and are printed with vegetable based inks. Even if you don’t buy these for the holidays, know that you may see them in your hotel room if you’re a frequent traveler of any top spas and resorts. The Glen Ivy Resort & Spas, Four Seasons Chicago, The Spa at Camelback Inn, Ritz-Carltons, The Trump Chicago, Hershey Hotel and Hyatt Regencys and more carry these. If I saw these in my hotel room I would totally lie and tell room service I didn’t get any and hoard these babies like they were going out of style. They are just THAT good. Does any scent of these four speak to you? I am dying over Backcountry Caramel. SO delicious and such a realistic scent! Also- check them out on Instagram! mmmmm the caramel one! That sounds like a scent I’d enjoy. I cold really get into these. These sounds so good ….. I am loving the sound of grapefruit and ginger! These sound amazing – MUST try! Ok it’s decided I NEED all of these. I am such a hand lotion person and these sound amazing!!! I would love Fresh Melon! Sweet Cream sounds really lovely. These would make great gifts for my co-workers. They sound lovely, the new scents especially!! I would love to try the fresh melon one!! I love ginger scents, and that sweet cream sounds amazing! These sound so nice and look so luxe! Sweet Cream sounds divine and like it would be right up my alley! Cute! I love the packaging and also I love the wood background in the photos, it really makes the products pop!